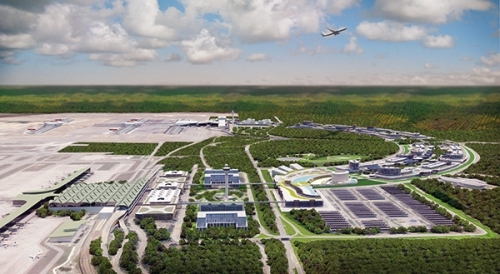 Airport World finds out more about the blueprint for a pioneering aerotropolis development at Kuala Lumpur International Airport. Malaysia Airports has unveiled plans for what it claims is its “most exciting endeavour” to date, the creation of a huge, national economy boosting aerotropolis at Kuala Lumpur International Airport (KLIA). Identified as one of the strategic pillars in the airport operator’s five-year business plan, Runway to Success 2020 (RtS2020), it describes the planned aerotropolis as an “eco-system development that is synergistic with the airport business and aligned with Malaysia’s development agenda”. Effectively a blueprint to transform Malaysia’s busiest gateway into a “world class airport city” and tourist destination in its on right, Malaysia Airports calls the project KLIA Aeropolis and admits to being inspired by airport city developments at Amsterdam Schiphol, Frankfurt, Incheon and other gateways across the globe. Success in its endeavours, states Malaysia Airports, will signal its transformation from an infrastructure provider to a key economic enabler by contributing significantly to the national GDP and job creation. “We have decided to develop KLIA Aeropolis in response to the demand that exists for businesses and trade to thrive in an environment that offers connectivity, speed and agility in one place,” says Datuk Badlisham Ghazali, managing director of Malaysia Airports. “Asia and ASEAN countries are the new emerging economies with ASEAN GDP expected to double by 2020 to $5 trillion. Meanwhile, Malaysia, with its location in the heart of ASEAN as well as its extensive air and ground network, and ready pool of skilled talent, is expected to experience GDP growth of 4.9% per annum up to 2020. “The decision was taken in tandem with the intention of establishing KLIA as the preferred ASEAN hub, which is also one of our RtS2020 strategic pillars. KLIA’s land bank of over 100 square kilometres certainly gives it a distinct advantage over most other gateways in terms of having space to grow and develop. And with only a fraction of it used today and just 60% of the site set aside for aeronautical use, the airport has an abundance of land available for the development of non-aviation related commercial activities. “The land designated for airport and aeronautical use will serve the core airport growth needs over the long-term,” explains Badlisham. According to Malaysia Airports’ development strategy, KLIA Aeropolis will be a demand-driven project initially centred on three key clusters – Air Cargo & Logistics; Aerospace & Aviation; and MICE & Leisure. As a result, plans are on the drawing board for a Cargo Logistics Park, Aerospace Park and a Aeronautical Support Zone for MRO (Maintenance, Repair, Overhaul) services across 90, 100 and 200 acre plots respectively with the airport operator admitting that it is considering a number of options for funding and developing the projects. “Various financing options and development structures are being evaluated to ensure the maximum value to the airport,” says a spokesman. “These include BOT type projects funded by private investors but built on land under Malaysia Airports management and leased to them on long-term contracts. The existing Sepang International Circuit used for Formula 1’s Malaysian Grand Prix sits within the area allocated for leisure and recreation/MICE related projects. Talking about the Air Cargo & Logistics cluster, Badlisham notes that express cargo shipments at KLIA have grown by 33% since 2010, mirroring the growth of the e-commerce market in South East Asia, which is expected to account for $35 billion worth of business annually by 2018. And with intra-Asian airfreight projected to grow by an average of 6.5% per annum up to 2033, he believes the future potential of air cargo for KLIA is clear for all to see. He is also confident that KLIA Aeropolis has the potential to become a leading centre for aerospace development, pointing out that the country’s appeal to the industry has already led to over 300 companies setting up operations in Malaysia, a quarter of which are based at either KLIA or Subang, about 60km away from KLIA. This boom has led to the country formulating a clearly defined national aerospace blueprint that aims to position Malaysia as a leading player in the global aerospace value chain. “Boeing and Airbus tell us that 30% of all their aircraft deliveries today are to the Asia-Pacific region,” comments Badlisham. He adds: “As a result of this strategy, KLIA Aeropolis will enable an aviation business eco-system by leveraging on businesses such MROs and OEMs. It will function as the core of Malaysia Airports’ aerospace belt, which includes Subang and Melaka airports. Based on PWC’s economic analysis of the KLIA Aeropolis development plans – excluding airport terminal operations and expansion – the total estimated impact of the project over a 15-year period could amount to a GDP contribution of around $7.2 billion and 56,000 new jobs. The projected figures certainly support the government’s agenda of striving to make Malaysia a high-income nation by 2020. Sharing his aspiration on the future of KLIA Aeropolis, Tan Sri Dato’ Dr Wan Abdul Aziz Wan Abdullah, the chairman of Malaysia Airports, says: “I envisage KLIA Aeropolis to be a truly remarkable airport city development with top class tourism and business attractions.